OFFUTT AIR FORCE BASE, Neb. ― U.S. Strategic Command is assuming that North Korea successfully tested a hydrogen bomb Sept. 3, moving the country closer to the ability to destroy an entire American city, Air Force Gen. John Hyten said Thursday. The acknowledgment from STRATCOM came on news that North Korea had conducted yet another missile test Thursday, despite repeat warnings from President Donald Trump to desist and repeat outreach and attempts to pursue a solution through diplomatic means. 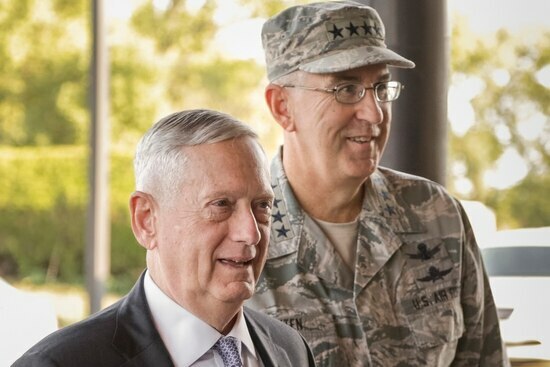 Secretary of Defense Jim Mattis was at STRATCOM at the time of the latest North Korea launch, which U.S. Pacific Command assessed to be an intermediate range ballistic missile. The missile “fired over Japan and put millions of Japanese in the duck and cover. It landed out in the Pacific,” Mattis said. Mattis was meeting with troops and getting briefings on the command’s mission around the time of the launch. When the launch occurred, he and Hyten went about three stories underground to the Global Operations Center, a conference room of screens and terminals that communicate with all of the various elements of U.S. missile defense. 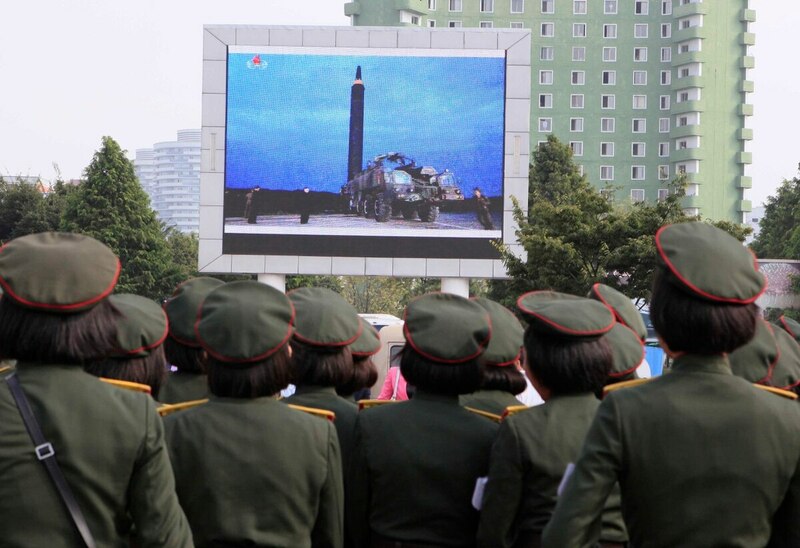 North Korea launched another ballistic missile Friday morning and experts believe it may have been, for the first time, an intercontinental ballistic missile with the capability to strike the continental United States. Hyten was speaking with reporters traveling with Mattis to STRATCOM Thursday afternoon when he was quickly pulled from the room, but officials at the time could not confirm the launch. Hyten did however discuss the significance of North Korea’s hydrogen test. “I saw the event, I saw the indications that came from that event. I saw the size, I saw the reports and therefore, to me, I am assuming it was a hydrogen bomb,” Hyten said. North Korea has also already shown that they have improved their missile range to give them the ability to reach a U.S. city, even if the missile tests have not been consistently successful yet. That did not give Hyten comfort. North Korea will face “strong military consequences” if it “initiates hostilities” with America or its allies in the Pacific, U.S. Secretary of Defense Jim Mattis reaffirmed Thursday, in an apparent break with a top White House advisor. Mattis said on Wednesday that the yield of North Korea’s latest explosion was more than 100 kilotons. Hyten, who commands all U.S. nuclear assets and is responsible for generating an attack in the event the president ordered a nuclear strike, said that the development is a game changer. North Korea fired an intermediate-range missile over Japan into the northern Pacific Ocean on Friday, U.S. and South Korean militaries said, its longest-ever such flight and a clear message of defiance to its rivals. To date, neither threats by President Donald Trump, nor gestures of continued diplomacy have kept North Korea from completing its nuclear weapons program. Hyten would not say whether the U.S. can at this point deter North Korea from developing the technology to launch a nuclear ballistic missile - but said that the United States could deter the country from an actual launch through the response it would bring. “The response will be the destruction of their entire nation and I think that does provide a very powerful deterrent,” Hyten said.